A good strategic planning framework analyses and decides what economic, environmental and social outcomes need to be achieved, and prioritises actions to achieve these outcomes. Strategic policies are then implemented through a variety of means, including statutory plans, infrastructure plans and service delivery plans. COAG’s review of capital city strategic planning systems sets nine criteria for assessing this process. A project should work within the context of the strategic planning framework. It should respond to the National Urban Policy objectives and the principles outlined in the Urban Design Protocol. It also needs to work within the strategic policies and statutory plans of the relevant State / Territory and local authorities (refer Line of Sight diagram). Relevant stakeholders, including the broader community, should be able to provide input and feedback at key stages of the process. They can help to develop the vision, review design options and provide feedback during public exhibition. A process that embraces design excellence requires visionary leadership. One way of encouraging this is to appoint a client-side project leader and ensure that delivering high quality urban design outcomes is a key accountability. For larger projects, consider a design champion within the project team, capability based selection, design competition and /or independent design review. 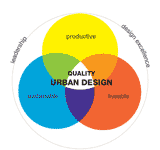 Urban design excellence is dependent on multidisciplinary teams comprising of consultants with appropriate skills and experience. Ensure the project team includes competent, skilled design professionals including land use planners, urban designers, landscape architects, architects and engineers as appropriate. Evaluate outcomes with reference to the Urban Design Protocol principles, and document areas for improvement or future rectification. Foster a culture which critically assesses urban design, builds design literacy, shares its best examples and rewards design excellence. Ensure that systems are in place for ongoing operations and management, to ensure the place is well-maintained and sustainable in the long term.